Shh! Some of the trust's nurses publicise the initiative. Nurses working night shifts at a hospital trust will be wearing soft-soled shoes as part of a campaign to help patients get a good night's sleep. The Sleep Helps Healing (Shh) project at Doncaster and Bassetlaw Teaching Hospitals NHS Foundation Trust aims to minimise night noise on wards to let patients sleep without interruption. Lights are dimmed at 11pm and patients are asked to switch their devices to silent and headphones used where possible. All equipment is placed within easy reach for staff and all buzzers, alarms and bleeps answered as quickly as possible. Patients are asked at ward transfer about their sleep routine, with their care plan tailored accordingly. 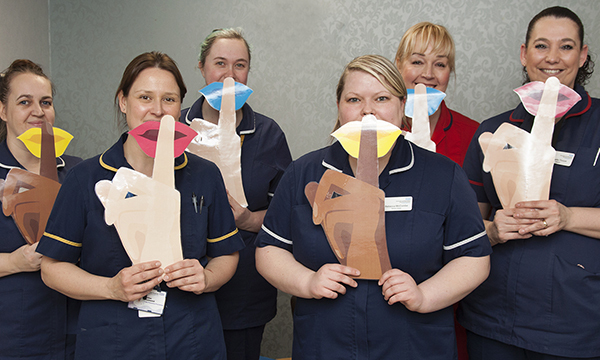 The Shh initiative originated at South Tees Hospitals NHS Foundation Trust and was adopted last December at Doncaster and Bassetlaw. Deputy director of nursing Cindy Storer said: ‘Ensuring patients staying with us get good, quality sleep is hugely important. Research shows Lack of sleep can lead to a weakened immune system, an increased sensitivity to pain, as well as general irritability. An NHS trust and health board survey by Nursing Standard in 2016 found television noise, beds being moved, staff talking, machinery, bins and doors closing were some of the most common sources of noise complaints from patients. A third of 70,581 in-patients questioned by the Care Quality Commission in 2015 said they were bothered by noise from other patients and 20% by noise from hospital staff. In 2015, the National Institute for Health Research awarded Oxford’s Kadoorie Centre for Critical Care Research and Education a £280,000 grant to investigate links between noise and recovery in intensive care units (ICU). The lead professor said his team found ICU noise levels were equivalent to those in a busy restaurant.